I yearn to be good gardener, and there's no earthly reason why I shouldn't be really. My mother has a prolific garden (there's such a thing as a gardening gene, right?) and my husband spent every summer in high school and college running a completely legit landscaping business (not just a guy with a mower). But excelling at gardening is something that has eluded me. I think it's because of poor planning. About this time every year, I find myself facing racks and racks of plants outside our local grocery store. I pull pots down, trying out combinations for imaginary planters on my front steps or non-existent beds in my backyard. Hydrangeas in the front? Veggies in the back? Plants are chosen, purchased, and home when it hits me...I have no idea how sunny or shady our property is. I plant anyway, and a few weeks later everything is dead, or leggy, or something it wouldn't be if it was planted in the right spot. Chalk it up to being away from the house too much or just not paying attention, but it turns out I'm not the only one who doesn't know what's going on in her yard during the day. 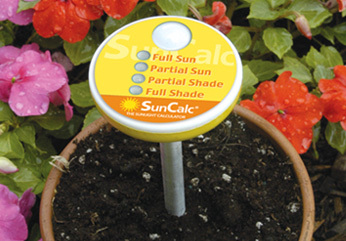 As I was perusing the June issue of Better Homes & Gardens this weekend, I came across the SunCal -- a little device that measures the amount of sunlight hitting a particular area during 12 hours of exposure. Seems I might have a better chance with those planters this year after all.